My secret weapon is "Cherry Limeade Crawl Cocktail". This sweet yet tangy cocktail goes well with just about anything you 're grilling, smoking or barbecuing. 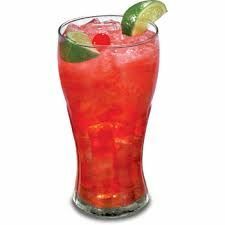 Put lime juice, lemon juice, cherry juice, water, and sugar in a blender and mix well. Fill glasses with ice and sugar the rim of your glasses. Pour mixture over the ice and a teaspoon of cherries until the glass is full. Stir and garnish with a lemon wheel and serve. Tip: Taste better poured over crushed ice.